The Friends of the Archives is a non-profit organization that privately funds some of the services, activities, and programs of the State Archives of North Carolina not provided by state-appropriated funding. Some of our most treasured documents are in critical need of preservation and restoration. After careful evaluation of these materials, the Friends has set their funding goal for 2018. The Carolina Charter needs immediate attention. The Carolina Charter of 1663 is considered the “birth certificate” of North Carolina. The document consists of four vellum sheets and details the granting of land in what is now known as North Carolina. It has been more than twenty years since the Carolina Charter has been examined for treatment. The document will be exhibited in early spring and repairs are needed immediately. 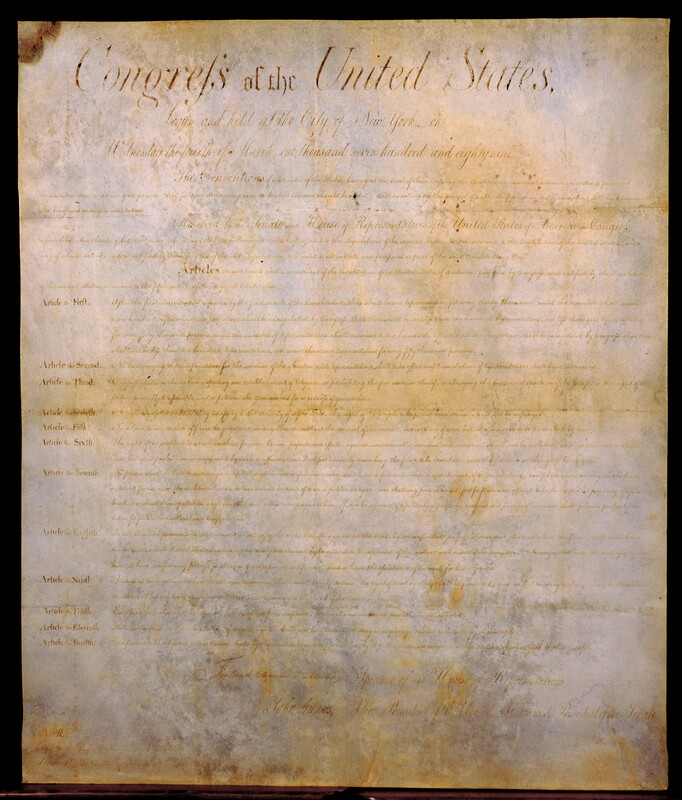 North Carolina’s original copy of the Bill of Rights serves as an example of North Carolina’s involvement in the ratification of the United States Constitution. The one-page document was presented to North Carolina after the ratification of the U.S. Constitution. The Papers of Peter Carteret, Governor of the County of Albemarle. The county of Albemarle is the oldest county government in North Carolina. 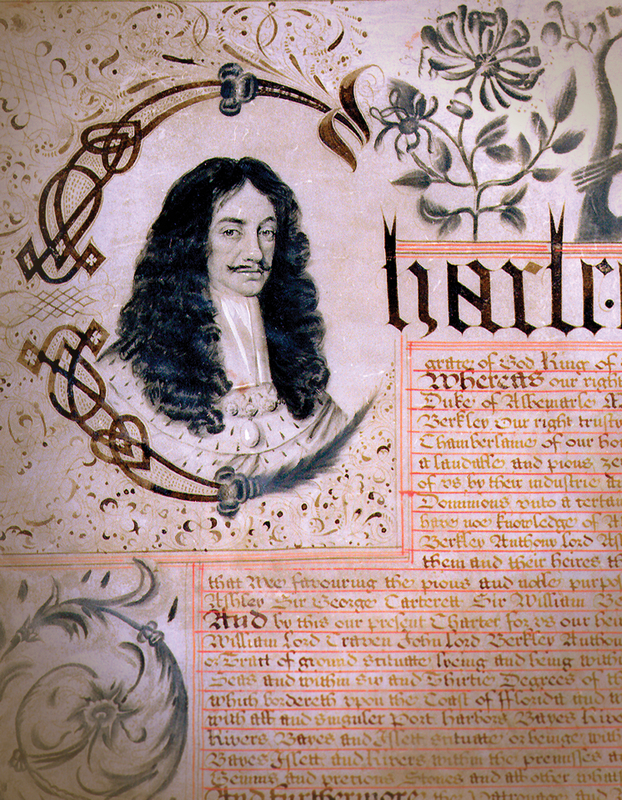 Peter Carteret served as governor of the Precinct of Albemarle from 1670 to 1673 and his papers document his influence and actions from 1666 to 1673 in Albemarle County. We have already raised $3,500 of the approximate $12,000 needed for the preservation of these documents. North Carolina’s copy of the Bill of Rights, 1789. Part of the Vault Collection. Available online at http://digital.ncdcr.gov/cdm/ref/collection/p15012coll11/id/29. These precious documents are exhibited for special occasions but even the slightest exposure to light can be harmful to them. With improvements in preservation technology, we will be able to conserve these documents for an extended period. To donate to this preservation fund, join the Friends of the Archives, or renew your membership, visit the Friends of the Archives website and click on Become A Friend of the Archives Today! If you are already a member you may donate on that same page. Benefits of membership include discounted registration to public programs and on some publications, DVDs, and posters. Please note that The Charter is now available only electronically, so please don’t forget to include your e-mail address. If you’ve already renewed for 2018 or made donations to preservation, thank you. As a member of The Friends your support is an important part of our success. This entry was posted in News, Preservation and Conservation and tagged conservation, Friends of the Archives, Preservation, treasures on February 23, 2018 by Ashley. Raleigh, N.C. – One hundred years ago, America entered the Great War and thousands of North Carolinians answered the call to serve their country at home and overseas. To commemorate the centennial of the war, the Friends of the Archives will sponsor “North Carolina and World War I,” presented by Jackson Marshall, historian and deputy director of the North Carolina Museum of History. The free, public program will be held in the State Archives/Library Building, 109 E. Jones St., Raleigh, June 19 at 1 p.m.
After his talk, Marshall will lead a tour of the World War I exhibit at the North Carolina Museum of History located across Jones St. from the Archives Building. The 6,500-square-foot exhibition highlights artifacts, period photography, a trench diorama, historical film footage, educational interactive components, and video re-enactments that feature European and North Carolina soldiers and citizens to relate the stories of ordinary men and women from North Carolina who provided extraordinary service to their country 100 years ago. The Friends of the Archives is a 501(c) (3) non-profit organization formed in 1977 to privately fund some of the services, activities and programs of the State Archives of North Carolina not provided by state-appropriated funding. The mission of the State Archives is to collect, preserve and provide access to North Carolina’s documentary history and culture. This entry was posted in Events and tagged events, Friends of the Archives, North Carolina Museum of History, press releases, World War I on June 8, 2017 by Ashley. Plan to attend Monday, June 6 at 1:30 as the Friends of the Archives presents “‘Bring Them Home’: Why We Search for the Lost Colony.” This free presentation will be held at the State Library/State Archives building at 109 E. Jones St. in Raleigh. The story of North Carolina’s “Lost Colony” is a simple yet compelling one. A late-16th-century effort to establish England’s first permanent settlement in the New World results in failure with the fate of its 117 colonists—men, women, and children—remaining unknown. But while this was just one of many similarly unsuccessful colonies, only this “Lost Colony of Roanoke” still asserts its emotional pull on public and scholarly imaginations across the centuries. Brent Lane is a professor of Heritage Economics at the University of North Carolina at Chapel Hill Kenan-Flagler Business School where he is Director of the UNC Center for Competitive Economies at the Frank Hawkins Kenan Institute of Private Enterprise. Brent works with several local, national, and international organizations on the importance of natural and cultural heritage in conservation, education, and the economy. This program is sponsored by the Friends of the Archives, a 501(c) (3) non-profit organization formed in 1977 to privately fund some of the services, activities, and programs of the State Archives of North Carolina not provided by state-appropriated funding. This entry was posted in Events, News and tagged events, Friends of the Archives on June 2, 2016 by avgabriel2. What do you think of when you hear the word “treasure”? Many people think of items like gold, jewels, or antiques. 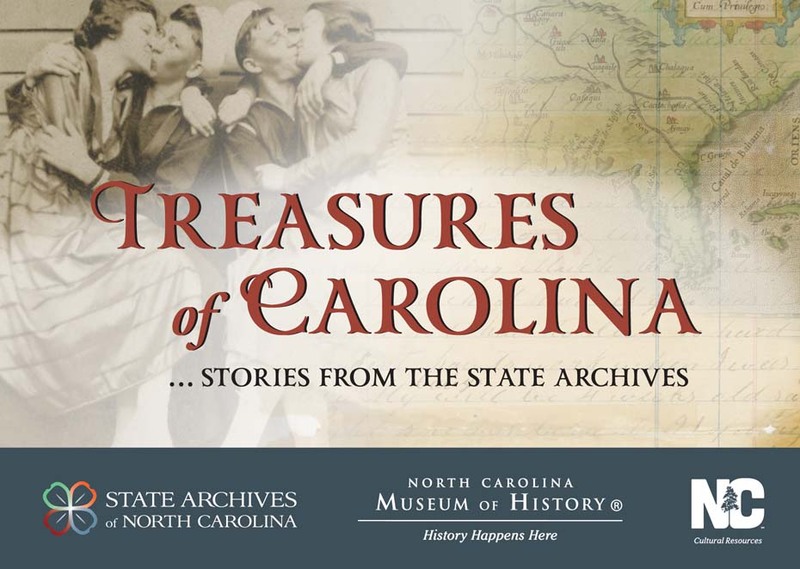 The State Archives of North Carolina presents an altogether different concept of treasure in the exhibit Treasures of Carolina: Stories from the State Archives, to open October 24 at the North Carolina Museum of History in Raleigh. Treasures, because these documents, records, maps, photographs, and other media are unique, irreplaceable, and sometimes quite valuable monetarily; Stories, because each item reveals the characters, narrative, and happenstance of how that document came to be and the significance of it to North Carolina’s history and culture. Visitors will learn about the State Archives’ role in preserving materials that provide evidence of rights and liberties, document government actions and operations, and chronicle our state’s history and culture. A companion catalog with detailed information about the items on display will be available for purchase. It will also include additional items not showcased in the exhibit. What is on display? The exhibit features both private collections and public records that supplement each other to reveal the nuances of our state’s history. The will of Mary Forsten, the earliest recorded North Carolina will dating to 1665, demonstrates the rarity of a woman property owner in the 1600s; a 1903 African American publication responds to the challenge of restrictive voter registration laws; the handwritten petition for citizenship from Chang and Eng Bunker, the famous conjoined twins from Thailand, reveals changing demographics in North Carolina, and a letter from wife to husband during the Civil War asks him to name their infant daughter. Other materials document the way handwriting has changed over the centuries, reveal how and why electronic records are preserved, and present the varied formats of photographs dating from the nineteenth century. The exhibit also contains voices of World War I soldiers recounting their war experiences, black and white film clips of the small town of Hillsborough in 1939, and a Union soldier’s sketchbook of scenes on Roanoke Island in 1862. Hungry for more information about the documents? Beginning next week, this blog will feature a weekly post about one of the artifacts on display so you can learn about its history before you visit the real thing. February 15 – June 14: Signature documents including items signed by George Washington, Thomas Jefferson, Abraham Lincoln, Franklin Roosevelt, Albert Einstein, and Buckminster Fuller, among others. This exhibit is sponsored by the Friends of the Archives and runs through June 19, 2016. Additional funding was provided by the N.C. Bar Association Foundation, the Raleigh Times, and Wells Fargo. This entry was posted in Events and tagged events, exhibits, Friends of the Archives, North Carolina Museum of History, Treasures of Carolina on September 9, 2015 by Ashley. 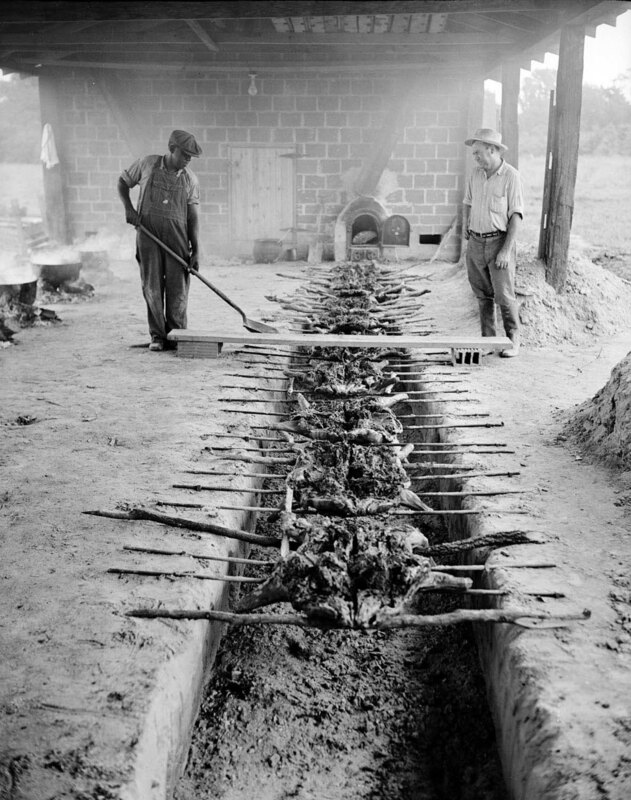 Barbecuing pork over an open-pit near Rocky Mount, NC, September 1944. 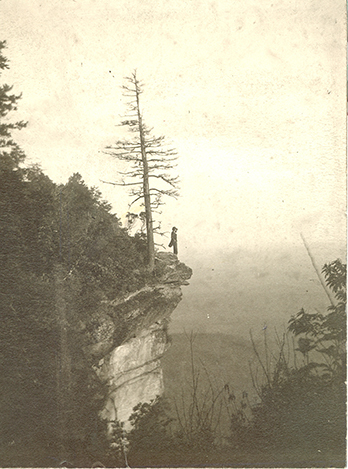 Conservation and Development Department, Travel and Tourism Photo Files. Call number: ConDev4648.5C. Learn more on Flickr. The Friends of the Archives Annual Corporation Meeting and Program will be held on Monday, June 1, 2015 at 1:30 p.m. in the State Archives/State Library Building Auditorium (109 E. Jones Street, Raleigh, North Carolina). The speaker will be Dr. John Shelton Reed who will talk about “North Carolina and the Original American Barbecue.” For more information, see the event flyer. This entry was posted in Events, News and tagged barbecue, events, Friends of the Archives on April 28, 2015 by Ashley.